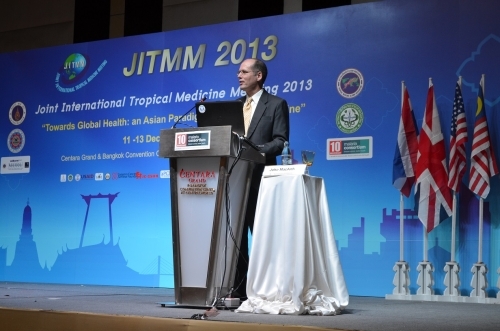 Dr John R MacArthur at JITMM 2013 - Malaria elimination hype or hope? At the joint international tropical medicine meeting, held in Bangkok in December 2013, Malaria Consortium hosted a symposium on resistance and elimination in the region. 'Taking the resistance out of elimination', highlighted current efforts to combat drug resistance in Asia as well as the major barriers faced in combatting resistance in the region, including reaching migrant populations and improving surveillance and information systems.